A goal of many OTR fans is to find as much information as possible about one's favorite program. For The Shadow, this would include the possibility of discovering lost episodes. A source for such episodes maybe the archives of a station or perhaps a local sponsor of the program. The January 1947 issue of SPONSOR magazine featured an historical overview of the sponsorship of The Shadow focusing on the major regional players at that time: 'blue coal,' Carey Salt and Balm Barr. It is the role of the local sponsor that will be the subject of this essay. How does one find a local sponsor? The few locals mentioned in the SPONSOR article were greatly increased by procuring lists of stations that aired the program. These lists were found in The Shadow Magazine, Shadow Comics, Radio Daily, and press kits of The Shadow, Monogram’s 1946 movie series. Some of these lists included sponsors. 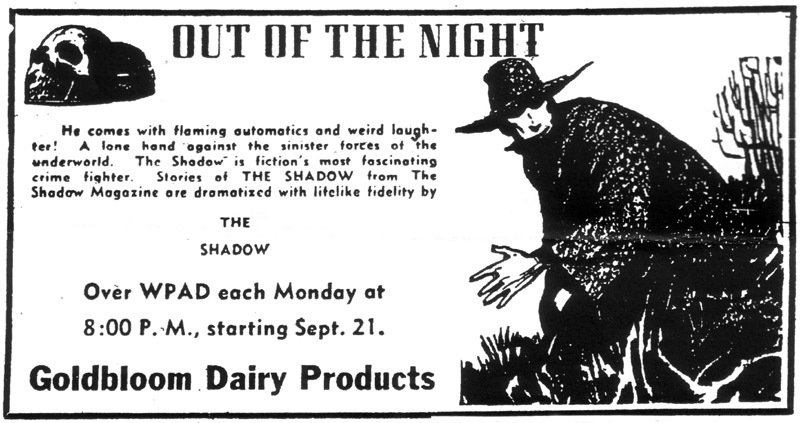 Once a station airing The Shadow was identified, microfilm of the local newspaper(s) was scoured for information including broadcast date and time, episode title/plot, and the sought-after, lucrative display ad. This resulted in a collection of many ads. Only those ads featuring the station, sponsor and an illustration of The Shadow are included in this article. Although local sponsorship of The Shadow began on a trial basis with a few stations during the 1938-39 winter season, it was not until the following year that the program was made available to all stations across North America. Program syndicator Charles Michelson was contracted by Street & Smith Publications, copyright holder, to sell The Shadow outside the 'blue coal' territory. This opportunity provided those Mutual-affiliated and nonaffiliated stations not serving the 'blue coal' market to air the program. One of these stations was WSLS in Roanoke, Virginia which broadcast the program via the direct network feed from Mutual. Kingoff Jewelers promoted their sponsorship of the program with an ad in The Roanoke Times heralding the new season on September 26, 1943. This ad was distributed to stations and sponsors by the Michelson office. However, the ad copy originally appeared in 'blue coal' markets during the previous 1942-43 winter season, as it was provided by the parent advertising agency, Ruthrauff & Ryan. Recycled copy material provided one avenue for those stations and sponsors who desired inexpensive newspaper advertising. Another source for display ad copy was The Shadow Magazine. On September 18, 1942, readers of the Paducah-Sun Democrat attracted to a picture of a skull and a figure emerging "OUT OF THE NIGHT," were encouraged to tune in The Shadow on Monday at 8:00 p.m. over WPAD. This Southwestern Kentucky CBS affiliate aired the program via electrical transcription. Goldbloom Dairy Products began its three-year sponsorship of The Shadow on WPAD with an ad featuring the artwork of Shadow pulp illustrator, Edd Cartier. This ad included illustrations from two 1939 issues of The Shadow Magazine. The copy was probably provided by the Michelson office, as a similar ad appeared in several February 1942 issues of the Cincinnati Times-Star promoting The Shadow every Sunday at 5:30 p.m. over WKRC. Ironically, the ad has not been found as yet, in any of the 'blue coal' markets. In Cincinnati, the local sponsor was the Premium Coal Company. This particular company did not sell 'blue coal' and thus, was outside the 'blue coal' territory. Premium Coal sponsored The Shadow for five seasons, from 1939 through 1944. Although the program was aired live from Mutual for most of the run, various parts of the 1939-40 season was heard Sunday nights at 9:00. WKRC also aired ETs during April and May of 1942 following the completion of the 1941-42 winter season. It is currently unknown which episodes were aired during the spring of 1942, it is most probable that these were from the earlier 1937-38 or 1938-39 winter seasons, as WKRC began airing The Shadow in September 1939. This premise is based upon a similar history with WGRC, the Mutual affiliate in Louisville, Kentucky which also commenced the broadcasts with the 1939-40 season. Upon the completion of various winter seasons, WGRC filled this Sunday time-slot with ETs of episodes from previous years. The Shadow WFMJ ad, original artwork copyright 1939 Street & Smith Publications, Inc. and reprinted with permission from The Vindicator, copyright The Vindicator Printing Company 1945. Edd Cartier art was very popular with newspaper ad personnel. His illustration of The Shadow holding a microphone was first exhibited in The Shadow Magazine to promote the summer 1939 Goodrich series. In 1945, it made its way to The Vindicator in Youngstown, Ohio to promote the program over WFMJ. In late 1943, Lustigs Shoe Store assumed sponsorship of The Shadow after Kohler's Dry Cleaners & Furriers switched to Flashgun Casey. This NBC-Blue affiliate aired The Shadow via ETs from April 1942 through June 1946. Broadcasts days and times varied from year to year. The ad displayed here is from Friday, June 8, 1945. As this copy had only been found in this newspaper, it is unknown if it was distributed by the program syndicator or was constructed by staff of the newspaper, station and/or sponsor. In a recent interview I conducted with Sid Kline, former advertising manager for Lustig's, did not recall the origin of the ad. However, he chuckled as he related the story of how the kids in Youngstown actually thought he was The Shadow. He had to disappear during the broadcast in order to avoid their disappointment. Ironically, this same story is mentioned in the above-cited SPONSOR article. One of the most intriguing renditions of The Shadow appeared in the Durham Sunday Herald. In November 1941, the West Durham Lumber Company initiated a five-year sponsorship of The Shadow over WDNC in Durham, North Carolina. Drawn by an unknown artist of The Herald-Sun advertising department, the caped avenger of crime with a lit cigarette appeared periodically in ads during this run. As Lamont Cranston occasionally smoked, it was interesting to find an ad that depicted The Shadow in this situation. 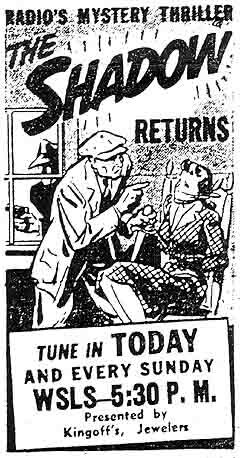 The Shadow WDNC ad, copyright 1941 Durham Herald Company. Reprinted with permission from the Durham Sunday Herald, November 23, 1941. WDNC, a CBS affiliate was owned by The Herald-Sun newspapers at that time; and thus network and local programs were featured in the daily and Sunday radio columns. The information on The Shadow usually included the episode title or plot, so that a chronological history of the ETs aired over WDNC could be established. Beginning in November 1941, WDNC aired those episodes from the 1940-41 winter season. This was followed by the 1941-42 winter season, then the 1938-39 and the 1939-40 seasons, respectively. By October 1943, the station was repeating previously aired ETs and this continued through March 1946. Few, if any, episodes from the 1942-43 and later seasons were aired on WDNC or many of the other stations that carried the program via discs. This may have been due to the ever-increasing shortage of materials during the War coupled with the music-recording ban of the mid 1940s. Live organ music was an integral part of each Shadow episode and thus, The Shadow was under the umbrella of the ban. Moreover, according to the SPONSOR article, no new ETs were produced as of September 1945; as the network show was sponsored for most of the nation, and it wasn't economical to produce the discs for a few open markets. Research into the role of those local sponsors featured above, has provided insight as to how The Shadow program was promoted in newspapers and aired on a particular basis by a given station. It is hoped that further research will lead to the discovery of a sponsor's archives containing air checks complete with the local sponsor commercials. 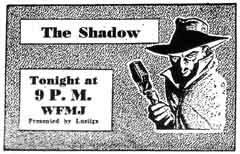 To date, no such recording of The Shadow has been found. Hopefully, such discs will not remain forever in the shadows. internet without the permission of all copyright holders. ABOUT THE AUTHOR: Karl Schadow has been researching and writing about the Golden Age of Radio for 25 years and specializes in mystery dramas, especially The Shadow. He has several hundred programs in his personal archives as well as hundreds of books, scripts and magazines. Karl Schadow has served as a research assistant and editorial consultant for the Radio Spirits' Legends of Radio Collections. He is also a contributor to Hake's Price Guide To Character Toy Collectibles. He is a club member of MWOTRC and SPERDVAC. Karl currently resides in Richmond, VA where he is employed as a limousine chauffeur. For additional information on The Shadow, you can e-mail Karl at bluecar91@hotmail.com or write: PO Box 1031, Sandston, VA 23150.